Under reamed piles are used in expansive soil (having high value of swelling and shrinkage properties ) to prevent uplift pressure caused by swelling such as in black soils. 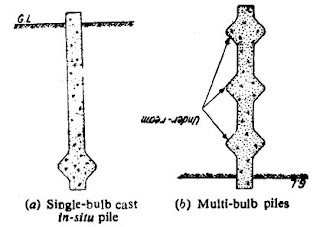 Under reamed piles can not be driven ,therefore these are essentially cast in situ bored pile .the depth of which bulb is placed should be in stable zone .it means there should be no fluctuation of water content .Due to bulb ,base resistance increase because the compacted soil below the bulb acts as a part of pile .The bulb diameter should be 2 to 3 times of shaft . 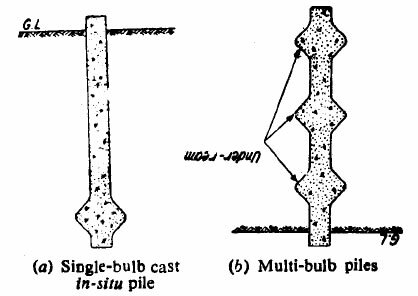 times the bulb diameter .